The original version of this article, by Keith Schneider, appeared on Circle of Blue. Choke Point: India is a research and reporting initiative produced in partnership between Circle of Blue and the Wilson Center’s China Environment Forum and Asia Program. Perhaps because India is so big, so bewildering and chaotic, and so determined to update its elusive rural identity with sleek urban flare, Indians and the national press are fascinated by how the nation’s wild animals are faring amid the dizzying change. In many cases, not well. Elephants, chased out of their natural habitat, trample forest hamlets. Tigers hunt outside of national reserves and are killed by poachers. Monkeys, hungry and thirsty in an era of declining water reserves, steal food and drink from festival banquet tables. But of all the allegorical reports about wild animals confronting the ruinous consequences of modernization, none so pointedly define India’s erratic and risky patterns of growth, or attract more attention, than the regular stories of sleek, stealthy, powerful leopards that become trapped in wells. On December 8, 2012, for example, newspapers in northern India’s Punjab state reported on a team of rescuers in Ratta Khera that pulled an eight-year-old male leopard out of a seven-meter-deep (22-foot) irrigation and drinking well. The leopard, thirsty and pacing precariously on the well’s narrow wall, had apparently slipped and fallen to the bottom. Though he was not injured, the powerful cat could neither claw his way up the well’s slick walls, nor launch himself out of the narrow space. Despite his strength and drive to succeed, the young leopard was, in a word, stuck. As a metaphor for modern India, the story of the leopard in the well is especially apt. This is a 66-year-old democracy, touched by boundless energy and driven by endless ambition. But it also is a nation trapped by seemingly inescapable walls of resource waste, management disarray, and cultural divides of its own making. During the last week of November and the first three weeks of December 2012, a Circle of Blue team studied the heroic and the enormously unstable paradox that is modern India. As our teams have done in Australia, China, the United States, and most recently in Qatar, Circle of Blue focused on India’s formative and globally significant contest between water, food, and energy in a nation that has doubled in population since the 1970s. Circle of Blue’s research encompassed the businesses, think tanks, and government agencies in New Delhi, the rice farms and mills of Punjab and Haryana in the north, and the open-pit coal mines and the renewable energy fields of Chhattisgarh in the east. Over the next four weeks, in comprehensive articles, infographics, and photographs, Circle of Blue will report our findings in Choke Point: India, the fourth major project in our Global Choke Point series, done in partnership with the Woodrow Wilson International Center for Scholars, based in Washington, D.C. In interviews with government experts, academics, business leaders, farmers, and citizens, all acknowledged that, in myriad ways, India’s water-food-energy choke point is steadily ruining the nation’s air and water, slowing its economy, and testing its cultural and political stability. But as we spent more time and talked to more people, Circle of Blue also learned that India’s resource choke point was just one crisis among a select group of interrelated structural clashes that are impeding the nation’s development. Efficiency in India’s governing systems is blocked by layers of offices, divisions, review panels, and administrators in ornate bureaucracies. Though defining itself as a market-based economy, India’s resource industries – water, food, energy, mining – are thoroughly controlled by state-owned companies. Bribery and corruption are so endemic that warnings of prosecution and appeals to transparency are posted prominently in the lobbies of big companies. Unlike China, Australia, the United States, and Qatar, in particular, India’s ever-fiercer competition for water by the agriculture and energy sectors is not the result of battling for scarce resources. Water reserves are ample. Soil is fertile. Reserves of coal are among the world’s largest. Rather, India uses its resource management practices as a social welfare policy to feed and support the nation’s poor. Electricity and water are provided free of charge to India’s grain farmers. That, in turn, produces enormous grain harvests that rot in storage before they can be distributed in the cities. It has also led to the proliferation of millions of electric water pumps that deplete groundwater supplies in the fertile northern grain-growing region. So much of the country’s electricity is used to power water pumps that India’s coal-fired electrical sector and government-owned coal mines cannot keep up with demand, forcing some new plants not to open, reducing the generating capacity of existing coal-fired power plants, and requiring ever-expanding and expensive imported coal to keep the lights on and the pumps running. India is now the world’s third-largest grain producer, fourth-largest energy consumer, and will soon pass China as the largest population. But in dozens of interviews and visits to critical food and energy installations, Circle of Blue also learned that India’s economy is slowing, even as its share of global pollution grows. Heavy reliance on coal to fuel 65 percent of India’s electricity – with plans to continue to push a coal-fueled future for at least the next three decades – has turned India into the fourth-largest producer of climate-changing emissions. The warming climate, in turn, is producing erratic rain and snowfall in India’s grain-producing states, reducing moisture and water that is available to recharge vital aquifers. As a result, farmers are drilling deeper wells and adding more powerful pumps to reach these new depths, a practice that consumes even more electricity and produces even more climate-changing gases. And though seemingly everyone from the farmers to business executives to government officials know that this cyclical system is unsustainable, solutions are both readily apparent and practical – like gradually charging farmers for electricity and water – and politically unattainable. Free water and power are so politically popular and deeply embedded in the economies of farm states that leaders who suggest a change have no possibility of gaining elected office. The broad outlines of India’s paradox are best defined by the country’s insistence on removing as much risk from the grain-producing economy as possible. India’s central and state governments manage the water supply, agriculture, and energy sectors as social services. Electricity to pump that water is free, too – all subsidized by a government that provides seed, fertilizer, and farm chemicals at little to no cost. And not only are the inputs free, but India also guarantees that it will purchase every kernel of wheat and almost every grain of rice grown in its fields, though much of what is produced is not reaching the hundreds of millions of poor Indians who need it, especially in the nation’s teeming cities. The effect on a nation that has known food shortages and starvation as recently as the 1960s has been profound. India’s grain production last year reached a record 247 million metric tons. So much rice has been harvested that 62 million metric tons – about 60 percent of the annual rice harvest – is stored in mountains of stacked burlap sacks under plastic tarps in hundreds of mills and storage depots across India. But the consequences to the water, air, and soil are significant and are growing increasingly dire in the era of climate change. Most of Punjab’s rice and wheat harvests are produced on land that is irrigated by groundwater. 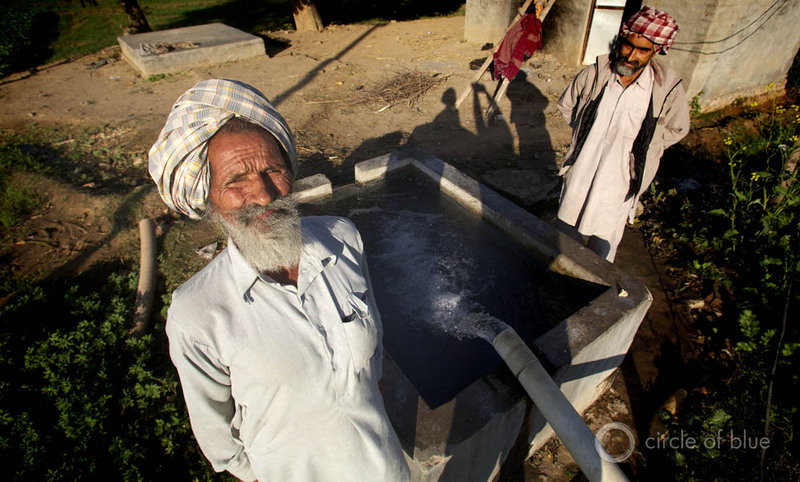 The excessive use of water is steadily draining water tables in Punjab and Haryana, pushing levels deeper into the ground and requiring farmers to dig deeper wells and use more powerful pumps to draw it to the surface. Nearly 40 percent of Haryana’s electricity is used just to transport water to farm fields. In Punjab, as much as half the electricity consumed during the spring and summer growing seasons is needed to operate pumps that draw water from 1.3 million wells. With free electricity to run pumps, and no cost for water, farmers irrigate day and night. The whir of pumps and rush of running water is part of the soundtrack of the region. So much electricity is required in a country that is not producing enough that Punjab and Haryana utilities schedule regular hours for brownouts and blackouts. Rice mills, for instance, operate at night, when electricity is available; if they require power during the day, they turn on generators that are powered by expensive diesel fuel. Water-wasting farm practices, moreover, are drawing salts to the surface and damaging soils in both states. Climate change is reducing rainfall in the Himalayan foothills and in the rivers that supply the region’s reservoirs and irrigation canals and that recharge groundwater aquifers. India’s leaders have long promised to electrify the entire country. Still, more than 400 million Indians do not have power in their homes. Some 65 percent of India’s electricity is generated from coal, with the balance supported by hydropower, biomass, natural gas, and nuclear energy. 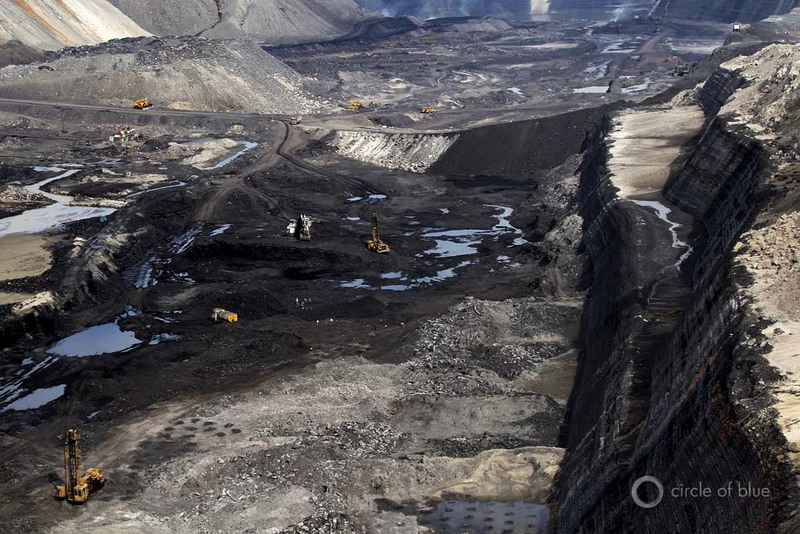 And India’s newest Five-Year Plan calls for coal mining production to climb almost 80 percent by 2017. With 67 billion metric tons in proven reserves still to be mined, according to the World Energy Council, India has the world’s fifth-largest coal reserves. Last year, India mined 540 million metric tons of coal, ranking it third in production behind China and the United States, according to the World Coal Association, the industry’s London-based trade group. But since national demand for coal reached 652 million metric tons last year, India had to import 112 million metric tons. Still, it was not enough. Even though India’s coal-fired capacity is currently growing by nearly 20,000 megawatts annually, much of the nation still suffers from widespread blackouts. The reason: consumption of electricity is growing more than 10 percent annually, while the domestic fuel supply – even with growing imports – is increasing by less than 4 percent annually. Half of India’s newest coal-fired plants are idle, in whole or part because they cannot secure adequate supplies of coal to fuel them. Last summer, half the nation went dark for days in July, an event that attracted global attention but was shrugged at by Indians who are accustomed to frequent and lengthy power outages. Coal industry executives told Circle of Blue that the process to open a new mine or to expand an existing mine includes a flurry of land, water, and air permits, which typically takes most of a decade to secure. But once the mine is open, environmental reviews are infrequent and enforcement is spotty. In addition, the industry is warped by corruption that turns permits into revenue-generating schemes for fraudulent Indian government officials. For example, a particular egregious case of favoritism in mine leasing and permitting is under investigation now in Delhi. Endemic problems caused by mismanagement can be solved with better management practices and government decisionmaking. For instance, India is missing a golden opportunity to electrify its rural villages and modernize its manufacturing economy by building and distributing decentralized clean energy electrical technologies, particularly wind and solar equipment that consume virtually no water. Providing Indian villages with electricity that is generated from localized clean energy sources could be a more efficient, less costly, and far less polluting alternative to coal, which now makes up the bulk of India’s electricity production. Extensive and expensive high voltage transmission networks are not needed, and they tend to be highly inefficient, anyway – nearly one-quarter of the electricity sent through India’s centralized grids is lost. Yet, with the exception of its plans to build more than 200 hydropower generating stations in the northern states near the border with China – proposals that come with their own distinctive ecological and diplomatic risks – India is largely disregarding clean energy as a mainstream source of power. Why? India views Western-style energy and electricity development as superior to decentralized power grids. Federally owned Coal India, the world’s largest coal producer, also is intent on developing its mineral resources and the big power plants they fuel. Both sectors support millions of jobs and the adult voters who Indian politicians rely on to stay in office. Meanwhile, though India’s national government has approved formal policies to aggressively develop wind and solar energy, as well as pursue energy efficiency measures, all three objectives are not yet mainstream goals. The constituency for clean energy in India, as well as alternative energy development and manufacturing jobs, while solid in government circles, is still scant in cities and the countryside. Like the leopard in the well, India is a nation deeply frustrated. Obsolete strategies in its management and resource policies and practices damage water and soil and encourage waste. Corruption is a second economy. Solutions, such as actually requiring farmers to pay a price for water and energy, remain out of reach for political reasons. India claws at the slick walls of change. Progress is grudging. Old policies take precedence. The consequences are impeding India’s development, damaging its treasure of natural resources, and risking the new wealth and global standing India has accumulated over the last generation. Future stories in the Choke Point: India series can be found on Circle of Blue. Keith Schneider is a Traverse City-based senior editor for Circle of Blue. He has reported on energy, water, and climate change from four continents. Circle of Blue was founded in 2000 to provide front-line reporting on water and its relationships to food, energy, and health. Photo Credit: Irrigation well in Punjab, used with permission courtesy of J. Carl Ganter/Circle of Blue; Asia’s largest open-pit coal mine, Gevra, used with permission courtesy of Aubrey Ann Parker/Circle of Blue. Video: “India: A Nation Heading towards an Energy and Water Choke Point,” courtesy of Allison Vogelsong/Circle of Blue.